Microsoft and Fox have agreed to share the much-lusted-after Killer Instinct trademark. 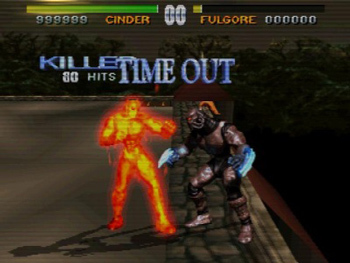 Bad news, litigation fans; It seems Microsoft and Fox won't be using lawyer-fu to decide who owns the rights to the words "Killer Instinct." In September of last year, Microsoft announced it was planning to renew the Killer Instinct trademark, which in that case was referring to the short-lived series of fighting games the company acquired alongside Rare Ltd back in 2002. Unfortunately for Microsoft, Fox had already registered a trademark for a TV show of the same name. Neither franchise is particularly relevant - there hasn't been a Killer Instinct game since 1996 and Fox's show didn't even finish airing in the states - so the companies have agreed to share the trademark rather than duke it out in court. Under the terms of the agreement, which was signed in late march, both companies can use the trademark as long as they don't stray into each other's territory. Essentially, my childhood dreams of a Saturday morning cartoon version of Killer Instinct are now even less likely to come true. It's still not clear if Microsoft was renewing the trademark just to keep it active, or if there's any kind of plans for the franchise. A full blown sequel is unlikely, but I wouldn't be surprised to see some kind of "HD" re-release floating around XBLA in the near future.